Just a quick post to show a two-page spread from my journal. I created this during my Dina Wakley class marathon last weekend when she came to Salem. It is not obvious from the photo, but the tags are in little pockets and can be pulled out. I used Dina’s acrylic paint, stencils, stamps and Ranger’s Tim Holtz tissue. Lots of fun! As with most mixed-media pages, this little piece was made with a number of supplies over several days. The Mixed Media Mojo July Challenge is to create something with a Summertime theme and a “seashell twist.” The Simon Says Stamp Monday Challenge is Nautical/By the Sea. So I set to work on this page with these challenges in mnd. The circles were from Gelliplate prints. I pulled out two stamp sets that I’ve had for years for a beachy feel. I’ve also been watching Marta’s art journal and mixed media videos at Maremi SmallArt, which have been very inspirational. 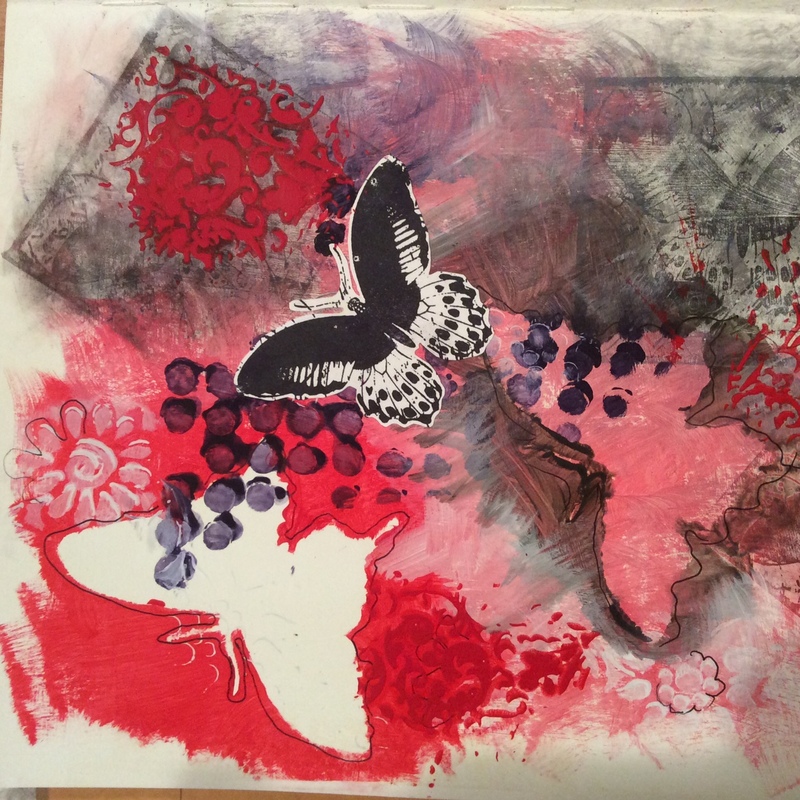 I built layers with gesso, tissue paper, Gelatos, ink sprays and stamping. Thanks for visiting today.